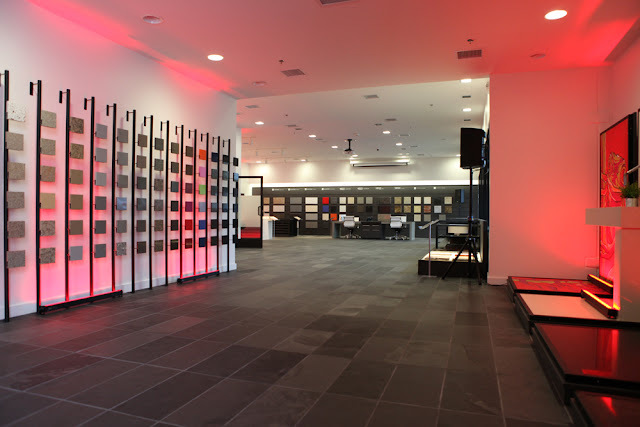 Silestone sent me a press release that I wanted to share about their new partnership with Sherwin-Williams to host eight Color Inspiration events at regional Consentino Centers across the country. "Through this exciting partnership, these category leaders will celebrate concepts in color and provide interactive tools to create the perfect palette for design." The first Color Inspiration event will premiere on the cusp of KBIS next week, Monday, April 23 from 5-8 pm at the Chicago Cosentino Center. "The Color Inspiration series will enable architects, designers and their clients looking for the latest color trends for the kitchen and bathroom. to be inspired by clever color matching combinations from Silestone's natural quartz surfaces and Sherwin-Williams dynamic hues. Select events will also take a look into the future, with a special color forecast presentation." "Each event will showcase the full range of more than 75 stylish Silestone colors including the new Stonium collection. Attendees will be able to digitally mix and match Silestone products with a coordinating palette of more than 1,500 Sherwin-Williams paint colors through the "Chip It" program. Additionally, attendees will receive a new Silestone color wheel to take away, which architects and designers can easily take to client meetings to help with the color selection process." Additional markets that will host a Color Inspiration event include: Atlanta, Orlando, Dallas, Phoenix, Anaheim, Los Angeles and Seattle. Sounds like it will be a great even. I wish there was one in Utah! Oh my god this is wonderful. Thanks for this blog, you and I agree that workers who work with silestone know what material it should be. MAG Projekt is one of these companies if I am not mistaken. Anyway, it was perfect!